The torrential rain cleared and a rainbow heralded the CETC (Cambridge Enterprise and Technology Club) Annual Garden Party. Around fifty members and guests wound their way through Wolfson College to reach its Lee Hall. Armed with drinks we chatted in groups and admired the Betty Wu Lee Garden through the opened veranda doors. CETC Chair, Dr Andrea Lorenz, wearing a shimmering red chinese jacket patterned with golden dragons, gave a welcome speech. Peppered with witty comments and reminiscences, she spoke of the past year's successful meetings and the ambitious 2017/18 program. Above all, she thanked the attending visitors and guests and invited them to take part in a competition to suggest future speakers and topics. The winner would win a flight over London in a four-seater plane - or the equivalent for those of a more nervous disposition. 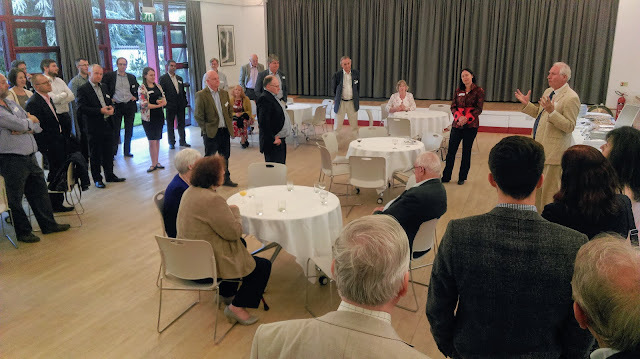 Cambridge MP Daniel Zeichner, was our invited keynote speaker and he reflected on the vibrancy of business, science and technology interacting and collaborating in Cambridge, due in no small part to networking and events such as the CETC talks. The food and the venue were excellent and the place was still buzzing with conversation at its close.